If you are concerned about security, give us a call at 800-749-9609 and speak with customer service. They have extensive experience in everything regarding pet doors. Q: Can a burglar stick their arm through the cat door and unlock the door? A: Generally speaking no – if a cat door is installed in the house door it will be too far down for anyone to reach the door lock. Q: Can a burglar stick tools or a wire through the cat door and unlock the door? A: In theory, maybe. In reality, it would be easier and more discreet to force the door open from the outside – or break a window. 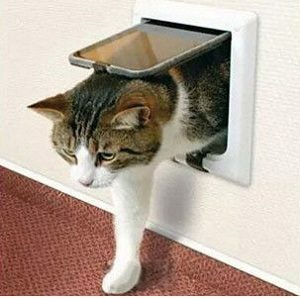 Q: Does a cat door mounted in a sash window offer a point of entry? A: Not if it’s correctly installed. The burglar can probably kick it in, but if they’re willing to go to such lengths and make that much noise, they can just as well break any window.